A map illustrates rainfall conditions across the St. Johns River Water Management District. 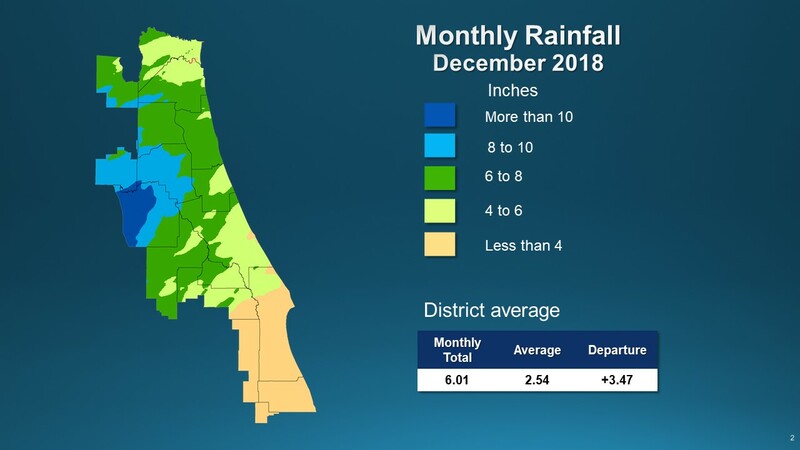 PALATKA, Fla., Jan. 15, 2019 — Data collected by the St. Johns River Water Management District shows rainfall during December 2018 as a mixed bag depending on whether you live in north or central Florida or in the district’s southernmost counties. Rainfall was above average in most areas, except for a zone of below-average rainfall in the district’s southernmost counties. A full report outlining hydrological conditions was presented at the district’s January Governing Board meeting. 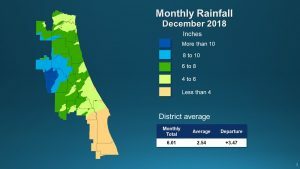 Less than four inches of rain was recorded during December in Brevard, Indian River and areas of Osceola, Orange and Okeechobee counties where the district collects data. But portions of Marion County recorded more than 10 inches of rainfall, and Alachua and Putnam recorded between 8-10 inches during December. Most of the district ranged between 4-8 inches of rainfall. Upper Floridan aquifer conditions (groundwater levels) were high across most of the district, other than in the southern counties where groundwater levels were in the normal range. Surface water flows correlated closely with rainfall amounts — flows in the southernmost counties were in the very low range, while north and central Florida surface water flows were average to very high. Lake levels across the district increased, except in the southernmost counties where there was a slight decrease. The district continues to promote winter water conservation in its “Skip a Week” campaign, which encourages property owners to cut back on irrigation to every other week during cooler months, when grass is dormant and doesn’t require weekly watering. To learn more about rainfall totals or the district’s “Skip a Week” campaign, visit sjrwmd.com.